As you can see, the image is completely distorted on the borders. It gets really narrow. 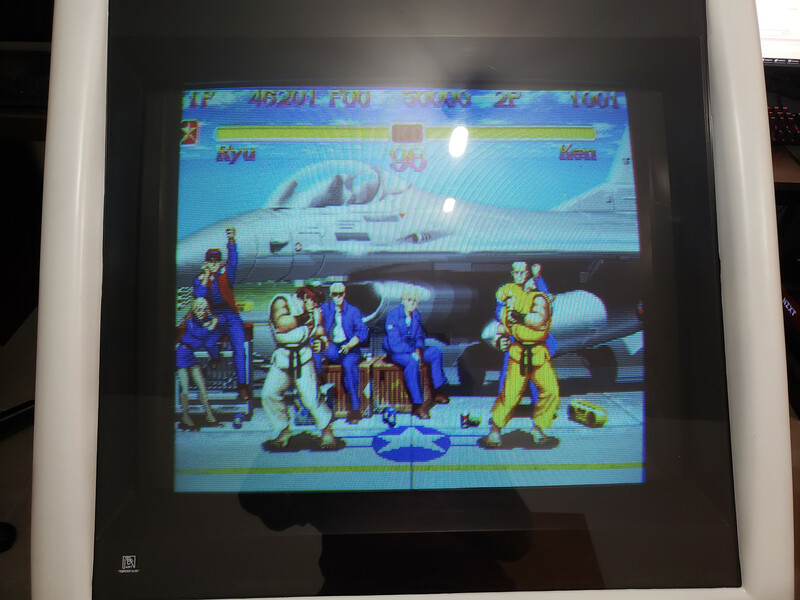 I've played with all the image control pots for horizontal and I can widen and narrow the image, but the image on the sides is always distorted. I've already replaced all electrolytic capacitors of the chassis with a new cap kit I purchased. After the cap kit replacement, nothing changed, the behavior is the same! 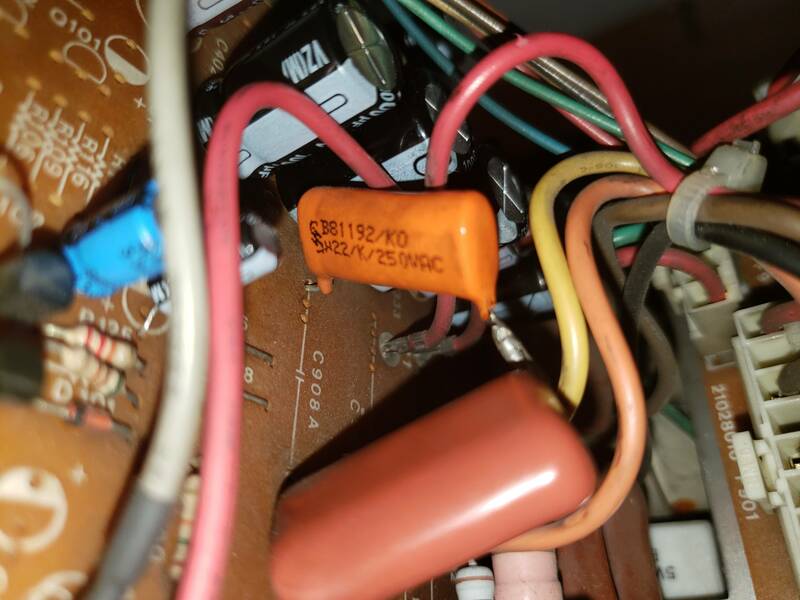 There is only 1 capacitor I did not replace because I'm a little confused about that one. It's C907. The cap kit came with a 4.7uF 100V cap (that is a very very small cap). Specs sheet tells that one is a 4.7uF 75V. So we are good there. The thing is I don't know if that cap has some relation to the geometry issue I'm having or If I have to look somewhere else. is this a recent fault? it could be a bad poly cap in the horizontal deflection, it could be that the chassis is not matched to that tube/deflection coil. Is the horizontal size pot working? Do you know which poly cap is responsible for the horizontal linearity? should I replace that one? commenting becasue i have a 2400 series troubleshooting cheat sheet written on the back of the schematic from working on these over the years. i'll take a look at it at work tomorrow. Thanks for the info. But you have a Makvision 2425. I know Makvision and Pentranic chassis are related in some way (or are the same brand? not sure). Is the Makvision 2425 the same chassis as the Pentranic CH-288?. What conclusions can I get from the info Rickn posted on your thread?. Sorry but I'm not understanding. all the chassis are clones of each other. makvision, petranic, weiya... all the same. it's common to call all the chassis the 2400 series. the 2400 chassis is basically a pentranic branded Wei-ya chassis (CH-288) pentranic later became? Makvision...spun off anyways. TL;DR - all the same. Ok, that is good to know! 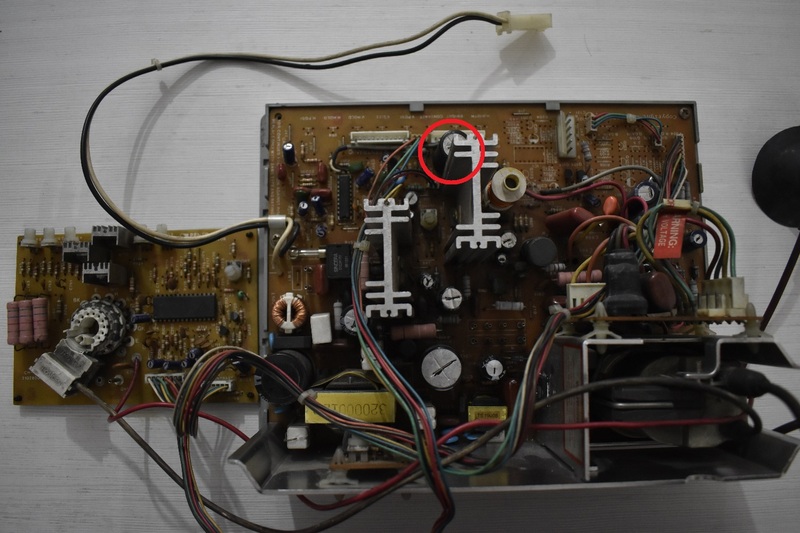 is this chassis always bee with this tube... did it work before and now doesn't? I ask because this chassis was used for several different tubes and gets configured differently for each one. if someone has swapped the chassis, it might need some parts changed to work properly. I'm not sure. I recently purchased this cabinet. I'm not the original owner. But, for what I saw, I'm pretty confident this is the original chassis of this cabinet. I also believe the tube it's the original one. I have a friend of mine that has 2 of the same cabinets (It's a WECHE OK Baby) and both has the same chassis and tube as mine. Whenever you have the chance to look at your notes regarding this chassis, please, share them here. I will really appreciate that. Ok, I've finally had the time to pull out the chasis again and take a look at C908, C908A and R904. I didn't notice this before... WHAT IS GOING ON HERE??? 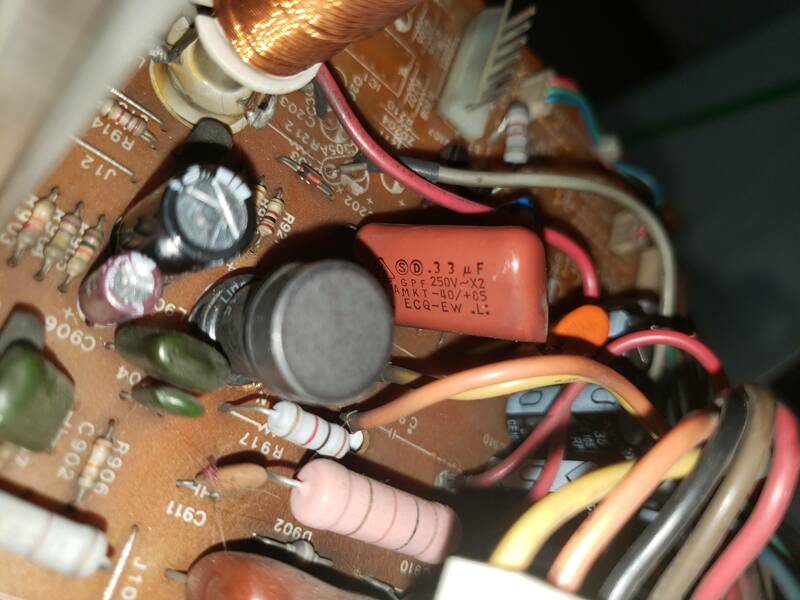 I've took some pictures of the capacitors that are there. Can someone explain me why someone did that modification? What is the purpose of doing so?. 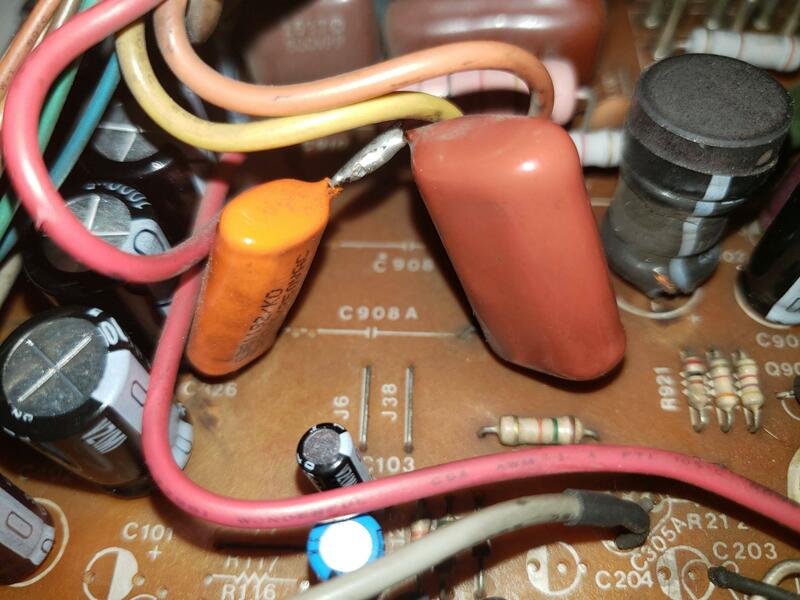 The values of the capacitors can be seen on the pictures. 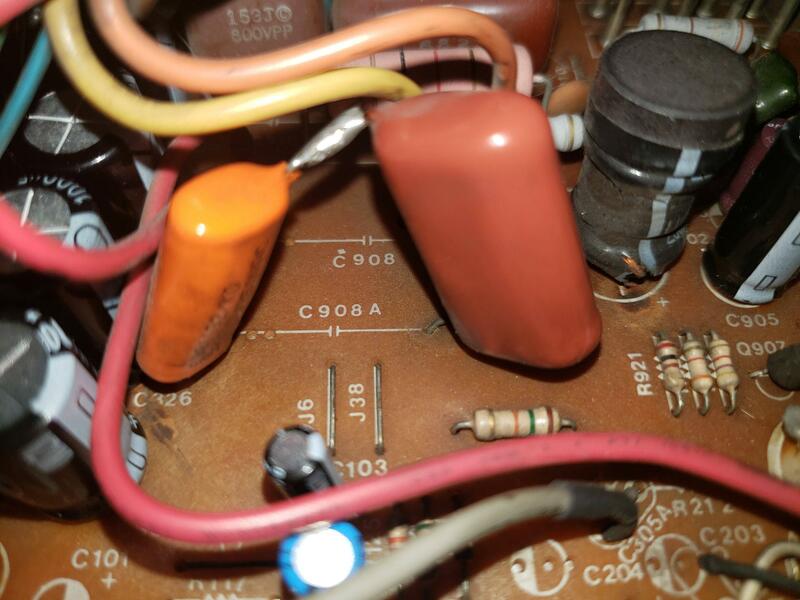 The Brown one says .33uF, which is, if I'm not mistaken, the same as a 334 capacitor. The Orange one confuses me... I can't figure out the actual value of that one! I'm not sure what to do now. 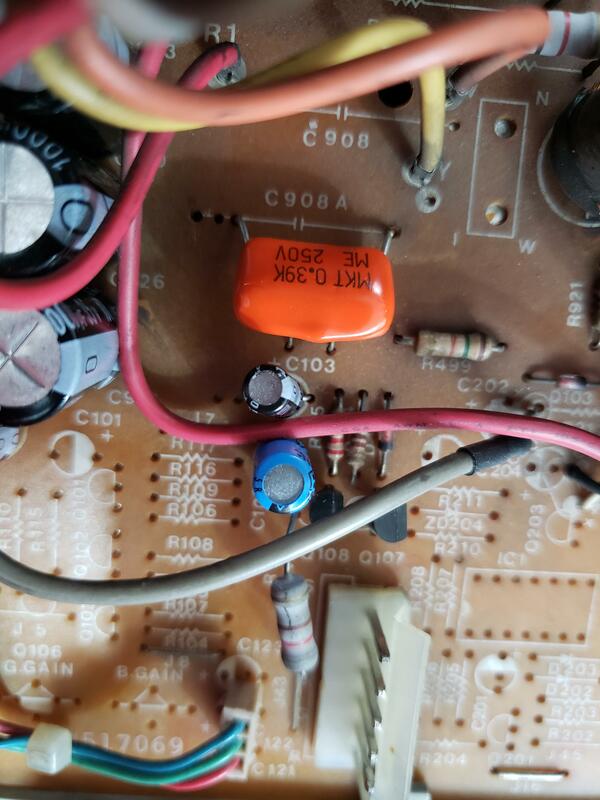 I need some input on how to proceed here because I don't understand which capacitors values should I put here or why someone bypassed the board traces by soldering this 2 caps together. not uncommon to see scabmods like that. in this case, you would add the 2 values together. so possibly .22? (it does have a 22/k.......) and .33 so maybe it's at 0.55 total. the B81192 indicates it's a class x3 capacitor typically used for electromagnetic spike suppression in surge suppressors. someone could have scabbed it in there. hard to say. i would start with dropping it to just the 0.33 (remove the yellow one) and see where you are at. if it's better, dump it down to 0.22 and see. if it's good, leave it. Question: Those caps were for the C908A. What about C908? There is NO CAP placed there. On the spec sheet it says it has to be a 334/250 (0.33 uF). typically you run with what's on the chassis. the schematic is more of a guideline. there are many MANY mods to these chassis to make them work with a multitude of tube/yoke combinations. this section is one of them. 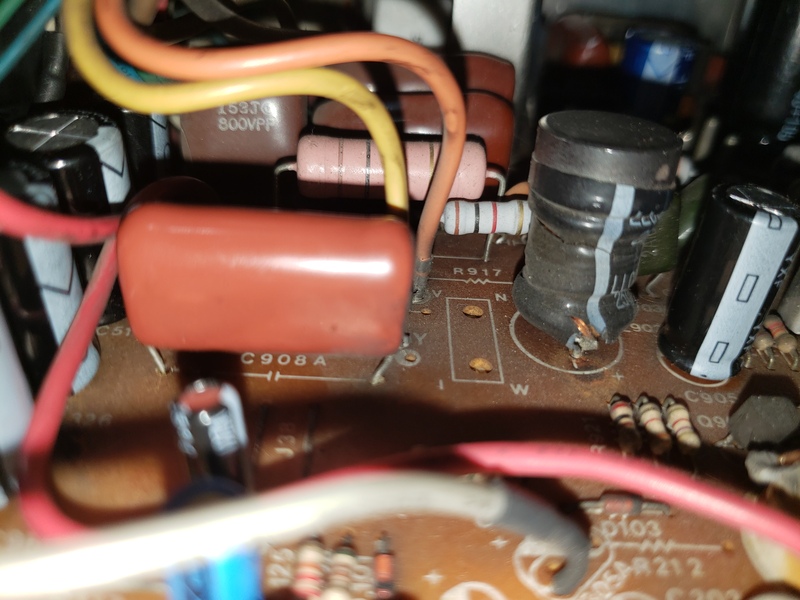 this capacitor basically sets up the oscillation of the yoke. OK, some good news!. I removed the .22uF cap (the orange one) and I left only the .33uF cap (the brown one). I did a test and the image got A LOT thinner. And the best news is that is not distorted anymore on the borders! 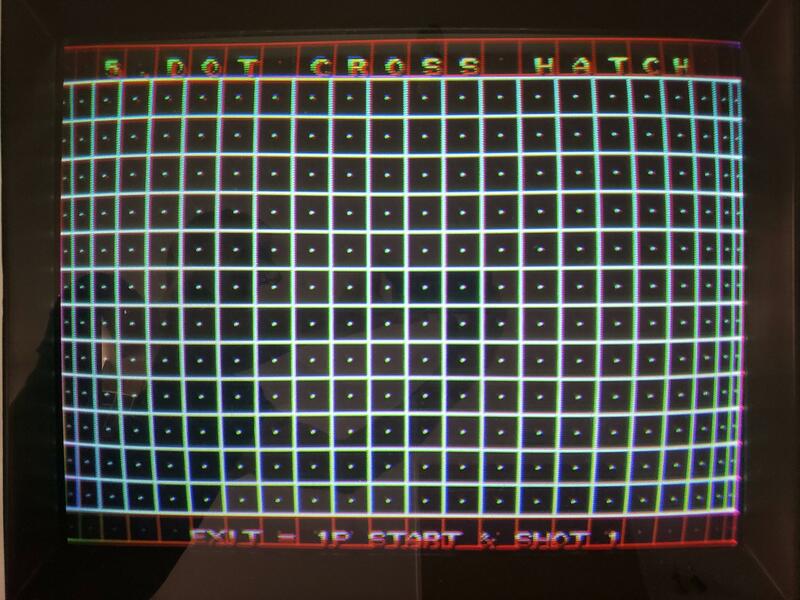 But using the pots to widen the screen is not enough to fill it completely. I assume 0.33uF is too low to accomplish that. Should I go with a 0.39uF like the spec sheet says? Here you have a video I made showing the general section of where this "N-W" it's placed on the chassis. Hope you spot something that helps me. In case there is no "N-W", does changing the C908A cap from 0.33uF to a bigger value help me in this case? Should I try something a little bit bigger, like a 0.39uF? honestly, it really can't hurt to try experimenting with a few different values and see what you end up with. Well, now I'm REALLY confused. Let's go back to basics: What happens when you put a HIGHER cap value on the horizontal deflection? The image should get wider? or thinner? honestly, I don't recall. It's been awhile since I've messed with the tuning cap. at least you are having fun and making progress. The last time I had to remove the anode from the tube, one of the metallic hooks broke in half, I had to solder that back. It was a pain to do it. And that is going to broke again eventually if I have to remove the anode a few more times. Since I'm not sure about how the value of the cap affects the width of the image, I'm going to buy a .22uF and a .47uF cap. I will start with the .22uF and if the image gets thinner, I will jump to the .47uF.